Mediatization and Mobile Lives: A Critical Approach contributes to a complex, situated and critical understanding of what mediatization means and how it works in contemporary life. The book explores the tension between the extended capabilities offered by media technology and growing media reliance, focusing particularly on mobile middle-class lives. It problematizes how mediatization is culturally legitimized in our times, when connectivity and mobility are increasingly seen as mandatory elements of self-realization. 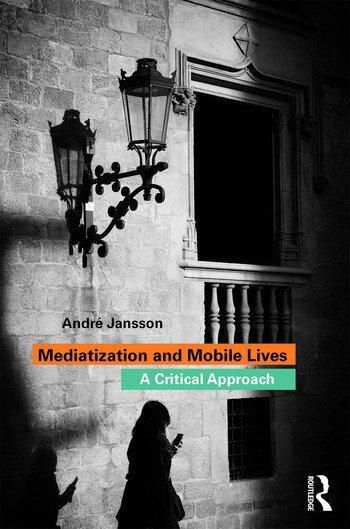 Supported by extensive fieldwork carried out in contexts of gentrification, elite cosmopolitanism and post-tourism, André Jansson advances a critical, cultural materialist perspective of mediatization as he examines how people are torn between the new opportunities afforded by their mobile lives and the feeling of being trapped by our connected media culture. Mediatization and Mobile Lives offers an engaging and critical exploration of the interplay between mediatization, individualization and globalization, making it an ideal resource for students and scholars of Media and Communication. 3. Why are media indispensable? André Jansson is Professor of Media and Communication Studies and Director of the Geomedia Research Group at Karlstad University, Sweden. His most recent publications include Cosmopolitanism and the Media (2015, with M. Christensen) and Communications/Media/Geographies (2017, with P. C Adams, J. Cupples, K. Glynn and S. Moores).